A tile range that is flying out the door as 2017 starts is our Moments Collection, which is an encaustic-inspired range of tiles. Encaustic or encaustic-replica collections, such as the Moments Mix below, are loaded with vibrancy and diversity - both in colour and design. They deliver bold yet harmonious statements within homes. They tend to become the centrepiece of rooms, and thus careful application will draw our focus to the significant spaces in any living area. 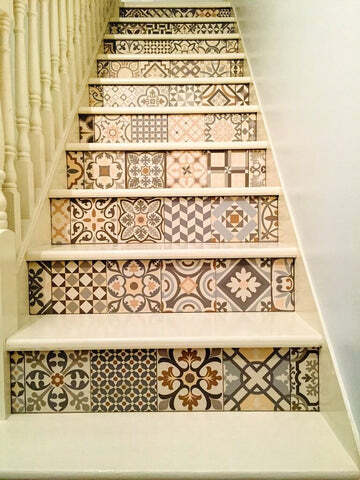 Encaustic tiles and encaustic-style tiles have become enormously popular in the latter part of 2016, and are set to take a place at the top of the tile market in 2017. In this article we’ll take a look at this ancient design and examine its contemporary revival. The encaustic tile (sometimes referred to as a ‘cement tile’) is a gloriously colourful and decorated handmade tile that was first fabricated in the mid-19th century. There's some dispute as to whether it originated in southern France or Catalonia, but either way it was embraced by the peoples of the Mediterranean, and then spread to the Middle East and the Americas. Indeed, at the beginning of the last century, this high-end floor covering was used to adorn thousands of landmark buildings in the United States. Their use diminished greatly with the arrival of the mass-produced “terrazzo” tiles in the 1960’s, but now this vintage tile has made a spectacular comeback. The term ‘encaustic’ is not so endearing, and hardly conjures up images of beauty and delicacy. The word originates from a type of ‘lost wax’ metal enamelling process, in which wax moulds are burned away by molten metal to create beautiful designs. Encaustic tiles have similarly beautiful patterns and designs that replicate this enamelling process. So as you saw in the video, the gorgeous designs come from a compressed pigment layer that's been hydraulically embedded into the tile surface. Their pattern is derived from the shape of the moulds in which they were pressed and the colours are embedded to a depth of 4 to 5 mm. Thus, the vitality of the design does not fade over time. The recent resurgence of the encaustic and encaustic-inspired collections is due to their versatility and the unlimited range of pigment composition, textures, tones, and colours possible. They are equally delightful as either floor or wall tiles, bestowing character and a range of desired atmospheres from fun to sophistication, rustic to urban, and homely to retro-trendy commercial spaces. Encaustic designs lend a beautiful feature to interiors and can nowadays be found in Parisian apartments, New York lofts, and Soho cafés. The intricate and timeless designs of an encaustic tile will add decorative details anywhere in your home, from a small alcove to an entire floor. But be careful! Encaustic motifs have a raw allure and almost magnetic attraction. Indeed the dynamic, vivacious patterns - whether in the form of floral bursts, geometric contours, or astral silhouettes - can tend to dominate a room and become the centre of attention. Thus it’s necessary to put some considerable thought into their installation. Many designers choose to adorn central parts of walls and floors with vibrant encaustic tiles, and to surround this critical space with more sober, monochrome tiles. Some designers prefer to let the magnificent designs speak for themselves, rather than be dominated by pulsating, vibrant colours. Thus the use of subdued greys and blacks, which is a favourite in many modern homes. An example of this would be our light grey encaustic effect Asland floor tiles. Note how the subtle colour scheme complements the wall colour. By framing the encaustic tiles with neutral grey floor tiles our attention is gently focused on the significant space within the room. Encaustic tiles can also be used to stunning effect in hallways, as demonstrated by our encaustic effect Heritage Mix floor tile. One of our customers enlisted a skilled tiller to create this wonderful staircase. The confident, vibrant look led from the front door and flowed upstairs. The tiles confer a strong sense of character and distinction as one steps into this home. And on walls, coloured encaustic effect tiles, such as our Moments Mix ceramic tiles, will allow you to create stunning statement pieces. With them, you can assert your individual personality and style onto your home. Even monochrome encaustic wall tiles can turn an otherwise simple bathroom into a masterpiece. A wall designed as below will always be a focal point, a beautiful artwork that draws attention upon itself. So if you want to revive the classic essence of the Mediterranean in your home, and evoke a cosy atmosphere reminiscent of the past, then perhaps our encaustic and encaustic-inspired ranges are for you. These collections are where the old world and modern design interact to offer you a range of possibilities – from the playful and bold to the classically conservative. And at our incredibly affordable prices, allow yourself to be inspired by the moment and give your home the design it deserves!